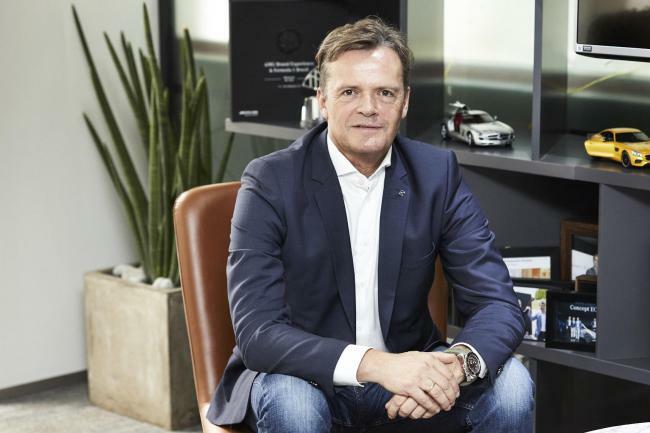 German luxury carmaker Mercedes-Benz will take on more Korean suppliers in its mission of navigating future mobility, particularly those in the fields of telematics, battery cells and automation of smart factories, said a Daimler executive in Seoul last week. Calling the carmaker’s R&D unit in Seoul an Asian hub for the German carmaker’s search of future mobility, Markus Schafer, Mercedes-Benz’s top manufacturing executive, told Korean reporters that the company is open to Korean talent and will increase “financial engagement” in the country. Schafer was in Seoul to attend the opening ceremony of Mercedes-Benz Korea’s renewed R&D center. Schafer is currently a member of the divisional board of Mercedes-Benz cars, production and supply chain. Founded in 2014, the center started with only four engineers. In addition to expanding the size of the center itself, the company plans to hire 40 more staff by the end of this year, he said. South Korea is the sixth-largest market for the German carmaker and second-largest in Asia, only after China. “Korea is one of the very important markets for us, (but also) Korea is a very important supply base for us, we are working with very innovative suppliers,” he said, highlighting Mercedes-Benz’s partnership with KT, LG and Nabis, a small and medium-sized company developing navigation maps. “We are talking (about) having more Korean suppliers,” he said, without revealing the names of potential suppliers. The German carmaker plans to test completely automated manufacturing of vehicles in its Factory 56 project, in an effort to pioneer transformation in the production sector. Touting Korean battery makers for their technologies that meet Mercedes-Benz’s high specifications, Schafer indicated that the company will seek expansion in partnership. “Korea is extremely strong in battery cells, they are very competitive and they are meeting with our specifications,” he said. SK Innovation, the energy arm of SK Group, supplies battery cells, while other top battery manufacturers Samsung SDI and LG Chem, forged partnerships with BMW and Volkswagen, respectively.